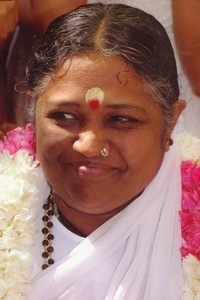 This is AMMA. I met her a couple weeks ago. Awhile back I was on the interwebs and came across a place called the AMMA center near where I live. I sometimes would take the road that the center was off of and at times, traffic would be creeping for miles while cars would be turning into a driveway that winded up the hills of San Ramon. I saw that AMMA herself was planning her Summer USA tour and I just knew I had to go. Now I admit I am spiritual however not really religious. I have tried Catholicism, Presbyterianism, Baptist, Christian and while I felt comfortable in all the church services I knew that I could not commit to just one. I really didn’t know why, but that it was a commitment I was ready for yet. 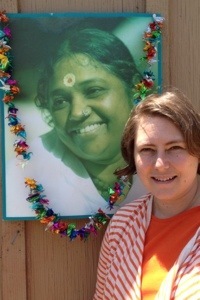 I read about AMMA and learned that she has spent her whole life embracing people. Hugging folks. That was her philosophy. I have always said HUG IT OUT. In fact my belief is that when I come across people who are in a bad mood or generally nasty, they should have been hugged more as a child. Hugs are magical in my book. They make you relax. They comfort. They bring people together physically and emotionally. They spread love. They release endorphins! If people hugged more the world WOULD be a better place in my opinion. In AMMAs life, at a very young age, despite cast and poverty, she hugged people who she thought needed it. She has accomplished so much in her life by embracing others. She is devoted to humanitarian life all over the world. My husband, son and I left early to the AMMA Center. I wasn’t sure what to expect. I had no idea who was going however I assumed lots of people would attend. When we arrived only 50 people were in line. We were briefed to take our shoes off before entering the temple. We would be seated and there would be a meditation session before AMMA began her embraces. As we entered the Temple, we lined up and were escorted to the front of the room. On the alter, or stage, people were preparing the platform where AMMA was to be seated. They were decorating with flowers and setting up the microphones. I turned around and realized the 50 people who entered earlier multiplied and now the entire Temple was full of a few hundred people. We luckily were seated in the second row from the front. I asked the woman next to me if she had ever seen AMMA before. She shared that she had not and wasn’t even sure if she was ready. She told me she had a hard time accepting hugs. I assured her it everything would be alright as I wrapped my arm around her shoulders and gave her a quick hug. Finally it was our family’s turn. I felt anticipation as we walked closer to the stage. It seemed like controlled chaos. There were helpers telling people waiting to come forward, to kneel, to stand, to hand over their offerings, to sit on a stool, to walk over to the side, to stay. Once the three of us were in front of AMMA she grabbed Joshua and embraced him. She began to chant, then touched my husband. She kissed Joshua on the cheek, and then I was told by one of her helpers that she was going to be giving us a family blessing. She fed us each a sweet, I was to kneel infront of her. As I kneeled she began to chant Ma Ma Ma Ma…I rush of emotion came over me as she embraced me and kissed both cheeks. My troubles disappeared and I felt content and most vividly I felt love. She smiled at me and smiled at my family and said another blessing for our family. Her smell was intoxicating. Rose. It remained on our clothes for awhile afterward. We were given another sweet wrapped in rose petals. We moved to the side of the stage and watched AMMA continue her embraces. As I watched I realized she knew what each person needed that day. Some people needed consoling, some needed to feel her love and some needed to be in her presence. It was a remarkable experience. AMMA changed me and as a family we shared a moment we would never forget. This entry was posted in growing, Knitting, My Home, Personal dialogue for a happy life and tagged AMMA, Family, love, spirituality on June 18, 2013 by amybailey aka knitsakes.